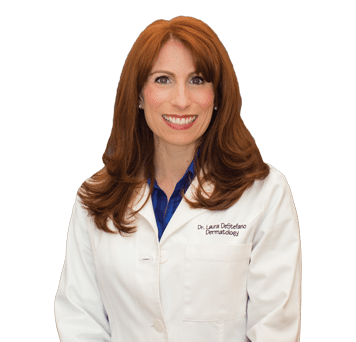 A native of the Philadelphia suburbs, Dr. Laura DeStefano is double board certified in dermatology and internal medicine. Dr. DeStefano received her undergraduate degree in chemistry from Haverford College and then taught science at the prestigious Gulliver Academy in Coral Gables, Florida. Dr. DeStefano realized her real passion was medicine and earned her medical degree from Nova Southeastern University College of Osteopathic Medicine in Ft. Lauderdale, where she graduated with honors. Dr. DeStefano completed residencies in internal medicine and dermatology at Columbia Hospital in West Palm Beach, Florida, where she served as chief resident. Dr. DeStefano has been practicing dermatology in Florida since 2011, where she has developed an excellent reputation not only for her surgical skills, but for her comprehensive and compassionate approach to patient care. In her free time Dr. DeStefano enjoys running and tending to her orchids.